By Taylor Branch. 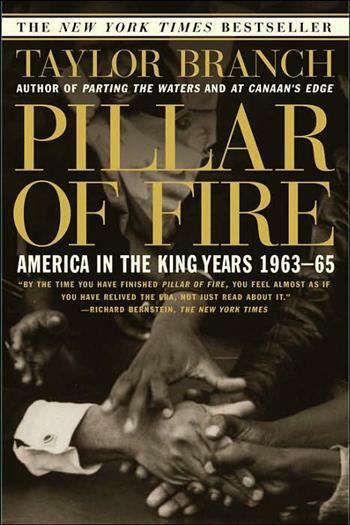 In the second volume of his three-part history, a monumental trilogy that began with Parting the Waters, winner of the Pulitzer Prize and the National Book Critics Circle Award, Taylor Branch portrays the Civil Rights Movement at its zenith, recounting the climactic struggles as they commanded the national stage. From Library Journal: Following Parting the Waters (LJ 1/89), his magnificent Pulitzer Prize-winning history of the Civil Rights years 1954-63, Branch's second volume of a projected trilogy takes the story through the heady years that saw the Southern Freedom Rides, Congressional battles over the Civil Rights acts, the March on Washington, the Birmingham bombing, and the assassinations of John Kennedy, Medgar Evers, and Malcolm X. Once more, Branch's national epic is knit together by the charismatic figure of Dr. King. We only think we know this story, which in Branch's masterly version seems freshened and newly impressive, told without cant or cliche. Simon & Schuster (1999), English, Paperback: 768 pages.